Oct 26, 2012 - S.D. “Aloe Vista.” A view of Scripps Pier at La Jolla Shores. “Gatorman.” The La Jolla Rough Water Swim is three miles from the Cove to Scripps Pier and back. 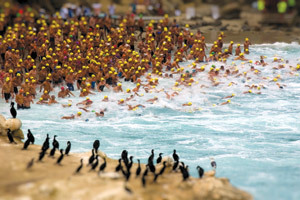 This photo was chosen for the Sony World Photography Awards 2011 Shortlist. 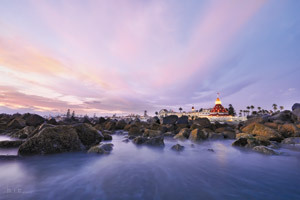 Landscape and travel photographer Lee Sie captures the vibrant hues of iconic sceneries and also the less familiar gems of San Diego in his exhibit at the San Diego International Airport. His featured work at the “Chromatic Cityscape” exhibit is on display at the Commuter Terminal until February of next year. His exhibit is one of a variety of exhibitions that are involved in the airport’s art program, which showcases local artwork that expresses the identity of San Diego. 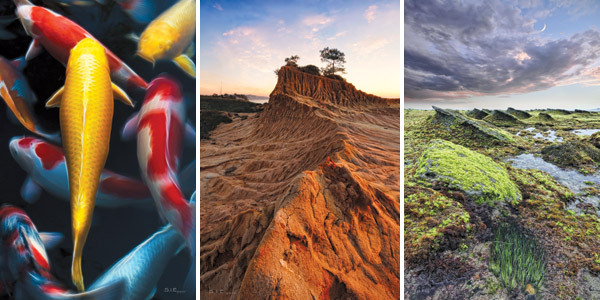 The five featured photographs, each of which convey a dominant primary color, featured at the commuter terminal highlight Balboa Park, Downtown San Diego, Torrey Pines, Hotel Del Coronado and La Jolla. 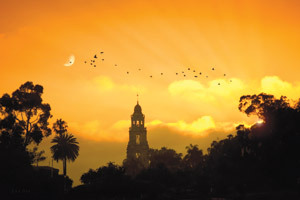 “Autumn Sunset.” View of the California Tower Carillon Bell at Balboa Park. Featured at the Commuter Terminal. Sie focuses on post-production photography to create his images. He was a film major and graphic designer when he started taking photos, so he applies those styles to his photography using different graphic techniques. By day, Sie is a programming operations coordinator at Time Warner Cable. He was born in Utrecht, Netherlands and grew up in Northern California. He then came down to “America’s Finest City” to obtain his telecommunications and film degree at San Diego State University and has no plans to leave his adopted city. “Hotel Del Coronado.” View from the water in Coronado. Featured at the Commuter Terminal. Sie has been a photographer for 24 years, focusing on landscapes and seascapes. He frequently participates in local art festivals and artwalks, most recently at the La Jolla Art and Wine Festival and the Coronado Artwalk. He said he receives positive feedback and occasionally is asked if he teaches classes on photography. “Maybe someday, I’d like to do that but right now, I just like giving tips to people and helping them out.” Sie has received awards from local contests, such as the 2010 Clairemont Garden Tour Grand Prize, and at the San Diego Fair. But his most notable breakthrough came from the image “Gatorman,” which was shortlisted for the 2011 Sony World Photography Awards and was featured in 2011 National Geographic Photo Contest. “Gatorman” was taken at the annual Rough Water Swim at La Jolla Cove. In addition, Sie has temporary and permanent gallery displays in San Diego and Encinitas at restaurants and other local businesses. “Brother Sun Sister Moon.” A crescent moon is a favorite subject of Sie. Sie said he just made proposals to officials in Clairemont. “It’s not for profit. It’s just to beautify the area and contribute my photography.” From galleries to airports and utility boxes, Sie’s artistic gems are adding to the beauty of San Diego. 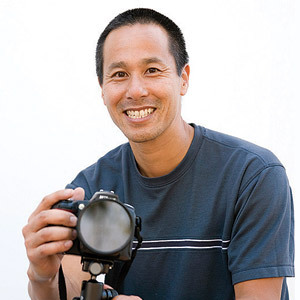 To learn more about Sie, call him at (858) 527-9900, or visit www.leesiephotography.com. [LEFT]“Gold Queen.” Koi fish at the Japanese Friendship Garden in Balboa Park. [MIDDLE] “Broken Hill.” Eroding terrain at Broken Hill in Torrey Pines State Park. Featured at the Commuter Terminal. [RIGHT]“Razor Reef.” Shoreline moss on rocks in La Jolla Cove. How do you feel about being able to exhibit your work at the airport? I was elated! When I first saw that it was going to be at the commuter terminal, I was thinking that’s one of the best options because it’s not as busy as the other terminals where people just tend to go by the artwork. People are going to be able to look at it and see and observe it more because it’s less of a high-pace area. But when I was there and saw how professionally done it was, I was amazed. It was like a museum gallery. I was floored when I saw the results. They even had the title and my name up there. It was definitely something I can’t even describe—the feeling of seeing my work displayed like that. Can you describe your process when you take a photo? For all of my photography, I use tripods. Usually, the photographer will be out there at the right moment at the right time. Sometimes that doesn’t always happen, so what I try and do is I’ve developed a newer technique. I try and grab several of the elements all at once. For instance, on some of my images, I’ll take a time lapse of several images. Some of them, two images at a half hour apart and I’ll combine them together. So, like a sunset will be in one shot and I’ll take a shot again when there’s either birds flying by or the moon is now in the shot. And I’ll take that shot and I’ll merge them together using Photoshop to get both or all the elements in the image together in one. I do a technique called blending and masking in Photoshop to combine those elements. I also do saturation increasing and make the vibrance increase also. I try and find the dominant colors and give those emphasis to make them stand out. Do you have any favorite spots to take your photographs? I started liking the area around Sunset Cliffs. As you walk down the beach to the very end, it’s very desolate. A lot of places have really low, negative tides and are only accessible certain times of the day. People are always asking me where photos are taken. Some places are usually underwater—at these really low, negative tides, that’s when I like to come out. It’s rare—it’s only certain times of the day that that happens. Sometimes because it shifts every six hours, you can only access them in the day on certain days. I keep an eye on the tides a lot. When it’s a negative tide, I try and get out there and see what I find. There’s always something new out there. How did you choose which works were displayed? They wanted something that was geared toward the iconic spots of San Diego but with a different perspective. I picked ten scenes of different iconic locations, like Balboa Park, La Jolla and different places that were kinda well known, but from a different angle. My emphasis was on color, so each scene had a primary color that was a dominant feature for the image. We narrowed it down for the wall space. We picked five images, which is really difficult because they were all ones that were my favorite, so we had to figure out which ones best represented the theme. How do you choose which places to take your photographs? I’m always looking on Google Maps to trying to find new places. 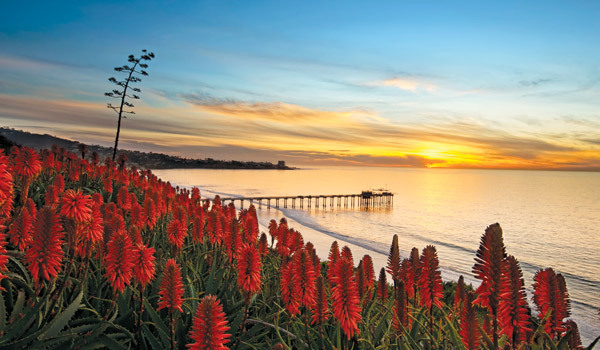 I started off in La Jolla and that’s, of course, where all photographers like to go. I try and find something different, so I’ve been searching new places to go and different areas. I don’t like to go to the cliché spots that are popular with photographers. I try to make my spots a little different that doesn’t show the typical scene that you would see regularly. Is photography your main profession? I don’t like to say I’m a professional photographer because then, people always want me to do their weddings or portrait shots, which I don’t like to do. So I just consider myself an artist. It started off as hobby, part-time. Now, it’s slowly taking more and more of my time, so I’m going more full-time doing this. I still have another full-time job that I do. What kind of message do you want convey to anyone who comes across your photos? It’s almost like, when I go out to the beach and you like looking at the grounds, the tide pools and all the final details, I like to combine everything all together that I see out there. From small details up close to the colors and the sky in the background. And nature and birds and all the elements of nature—I’d like to combine as much as I can into one shot. Sometimes, it can look like a simple scene but it can get pretty complex with all the details and elements I get in the shot. I’d like to create more than just the average scene of a nice, beautiful sunset. I like to include something else in there to make it just a little different [and] more interesting. I like to also point out the sun and the moon as a big theme, big icon that I’d like to include in my shots. 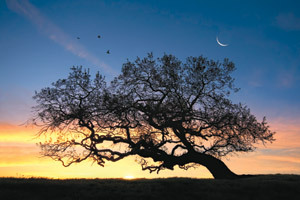 Whenever there’s a crescent moon out, I’d like to photograph it and incorporate it into the shot that day. That’s a running theme throughout my photography.